Of lobed quatrefoil form supported on four claw and ball feet with floral swags suspended from eagle heads, the ends with lion masks and the sides with two shields bearing the armorials. Painted in cobalt blue with some manganese, yellow and iron-red. 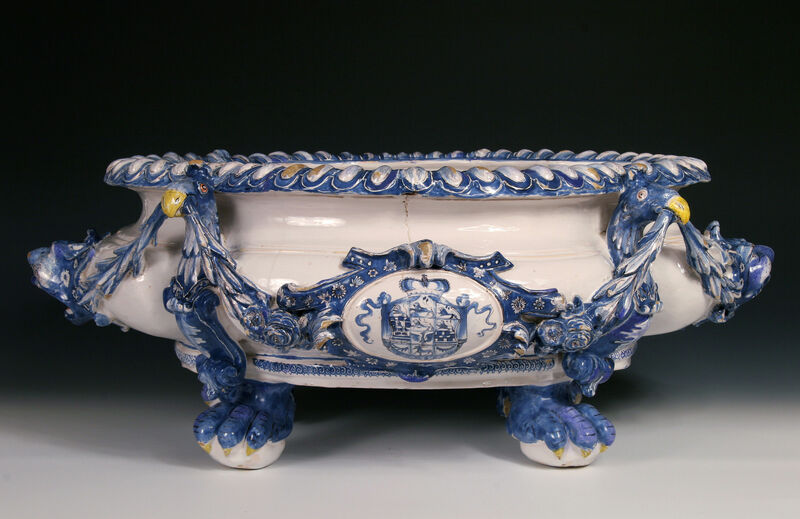 The Dorotheenthal faience factory was founded around 1715/16 by Augusta Dorothea of Braunschweig-Wolfenbüttel (1666-1751), the daughter of Duke Anton Ulrich of Braunschweig-Wolfenbüttel and the widow of Count Anton Günther II of Schazburg-Sondershausen (1653-1716). 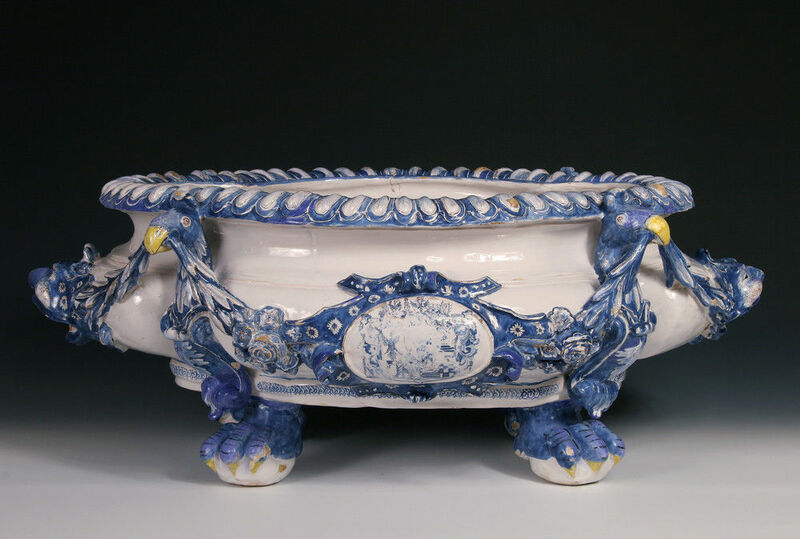 The first manager of the Dorotheenthal factory was Johann Philipp Frantz who had come from Braunschweig in 1715 with other throwers and painters. 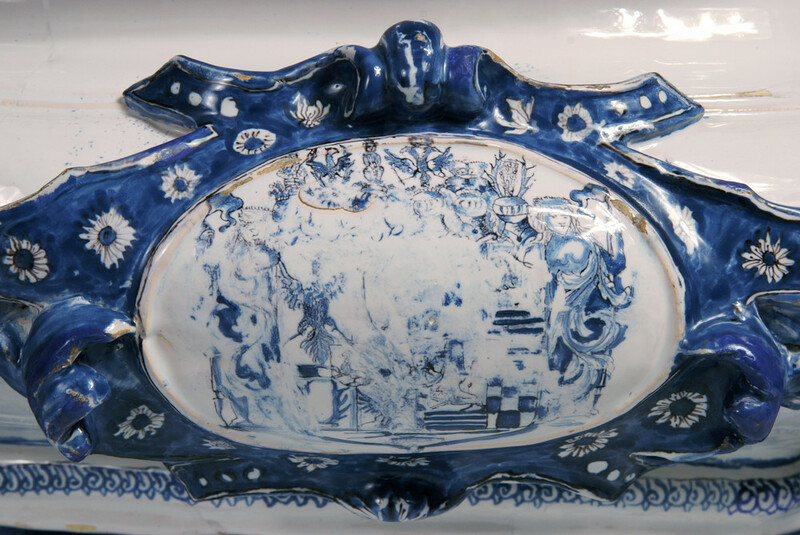 Augusta Dorothea’s father Herzog Anton Ulrich had established a faience factory in Braunschweig in 1707. Johann Philipp Frantz used the mark of a cursive ‘f’. 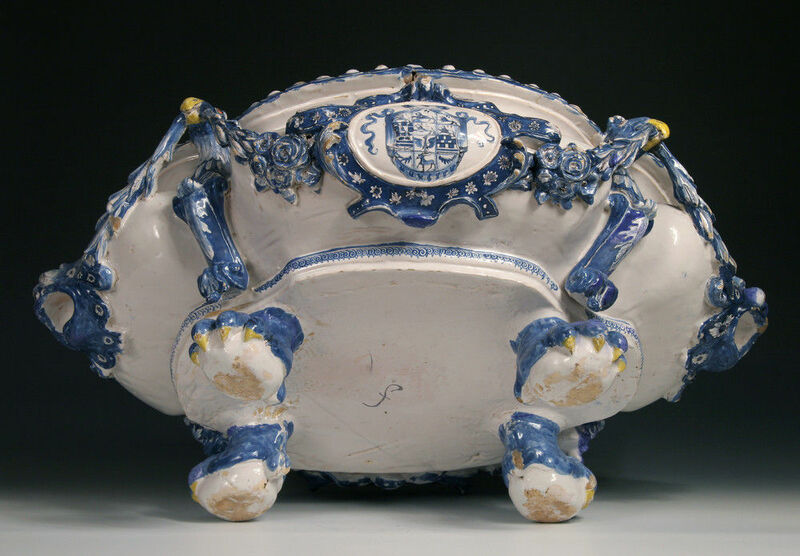 When Fürstin Augusta Dorothea died in 1751, Schloss Augustenburg (her widow’s seat near Dorotheenthal, together with all the movable contents, and all the records and invoices pertaining to the administration of the faience factory (her private property, as opposed to the property of the reigning house which would have been administered by the court in Arnstadt), was inherited by the Dukes of Braunschweig , which could explain why it entered the collection of the Dukes of Braunschweig. 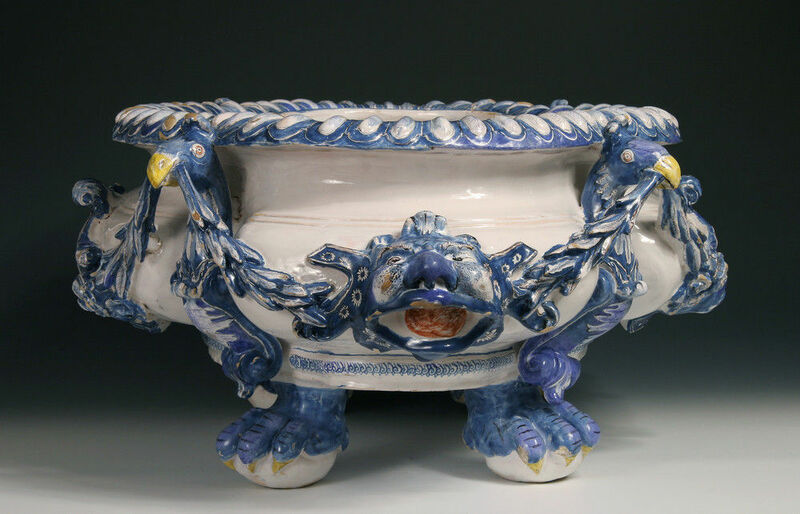 The Braunschweig faience factory was founded by Herzog Anton Ulrich in 1707, and remained a Ducal enterprise until 1710. 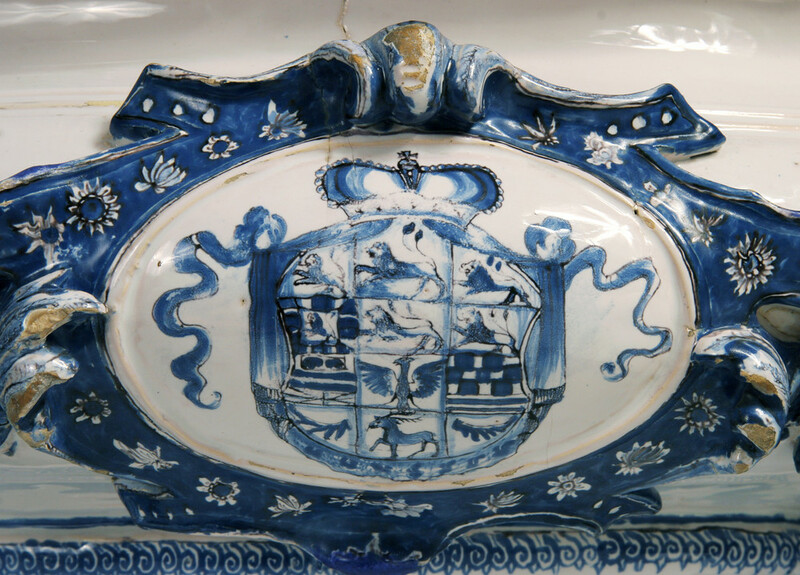 The early production mainly intended for Court and the furnishing of the palace at Salzdahlum. The Arms of the Fürsten Schwarzburg-Sondershausen have run in the firing and are partially obliterated. 5th to 15th October 2005. Literature – Adelheid Mahnert, Thüringer Fayencen des 18. Jahrunderts, 1993, p. 63.